Jeffrey Reed gives back to the community with the establishment of the Jeffrey Reed Courage Award. Read about the award here. 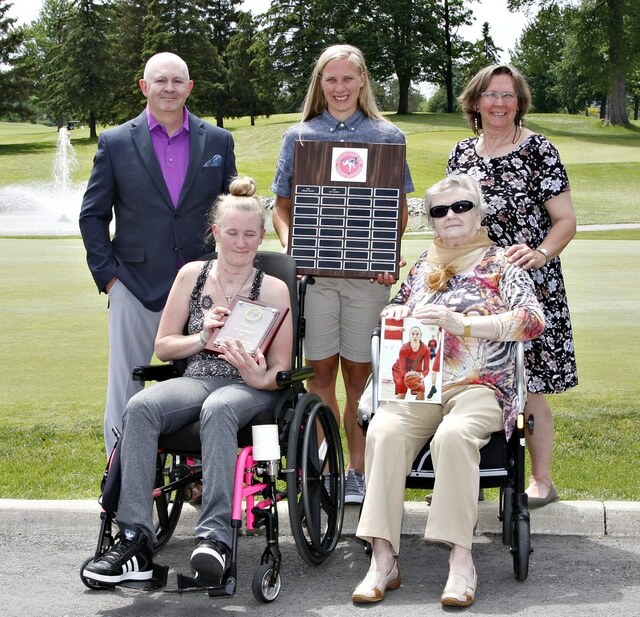 Jeffrey Reed awarded the 8th Annual London Ontario Golf Heart Award to Nike Golf’s Lindsey Edmunds on April 30, 2018 at Highland Country Club. Click here for more on the Heart Award. “Thank you for your speech – it was excellent, and everyone enjoyed it. We have presented you with a certificate of appreciation for your presentation. A donation will be made to the Rotary Foundation in support of Polio Eradication.” – Arun Sen, London North Rotary Club Inc.
“Thanks for the fantastic job you did on our 90th Anniversary brochure! It looks amazing and tells a great story! We can’t wait to share it with our employees and Londoners. Thanks again for everything!” – Janet Paolatto, Director Corporate Planning Sifton Properties Ltd.
“Jeffrey Reed recently demonstrated what determination and commitment can accomplish in overcoming personal handicaps. In an address to the Kiwanis Club of Middlesex May 17, 2012, he described, in graphic detail, how he persevered in sports, attaining levels of expertise that were indeed an inspiration to all who were fortunate to hear these true stories of personal achievement. – Bob Curtis, Director, Middlesex Kiwanis, London, June 26, 2012. “Dear Jeff: On behalf of the organizing committee and our tournament sponsors, London Motor Products, and MacMaster Chevrolet, we would like to thank you for participating in the 15th Anniversary June Golf Classic at The Oaks … Registration fees, sponsorship and “day of” activities resulted in a great day of golf and a gross profit of just over $46,000 to support the ongoing work of The Lung Association. Kindest Regards, Gary Westgarth, Committee Chair, Rosemary La Rue, Volunteer & Fund Development Coordinator. (Note: this tournament featured Jeffrey Reed at the 15th Hole challenge entitled, “Beat Reed.” Each foursome challenged Jeffrey to a closest-to-the-hole at the par-3 featuring an island green). ‎”Amino North America Corporation would not be where we are now without your strong support and kind assistance. I would like to take this opportunity to express my sincere appreciation for all the support and friendship that you have extended to me during my stay in Canada. I wish you continued success, good health and happiness. I am going to miss our business relationship and the beautiful country of Canada.” – Ichiro Joh, President, Amino North American Corporation www.aminonac.ca .